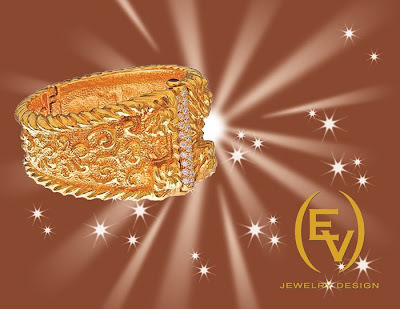 Welcome to EV Jewelry Design! The Lizabeta earrings are handcrafted in 18-karat white gold and have more than six carats of hand-set diamonds set to highlight four South Sea pearls. The pearls at the top of each earring feature a bezel-set diamond. The earrings also have screw back posts and backings for added security. They sell for $15,000. 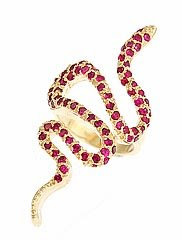 "Give in to temptation: wrap a stunning serpent ring around your finger. Hi! We are looking for jewelry designers to work on our products!If you are interested please send me your resume, and portfolios ate ruby@et2cint.com. We would love to enter into a contract per project and pay either commissions or fees. Love your image icon, great shot. How was India? I'm sure you had a great time. Things have been well here, thanks. looking for ideas to grow the clothing label. It is a challege in times like this, but certainly doable. Any advices? Just passing by to say hello and see how you are doing. Talk to you soon!! Thanks for the add. You have a very exquisite collection. Loved every piece that appeared on your website. Are you in the NY area? Are your pieces being sold at any retailer? Let me know if you ever need any garments for photo shoots, catalog pictorial, fashion shows... We could try to work something out. Please feel free to email me at giseleschaffer@mac.com as well as leave a message on my comment wall.